The text reads: "The first Welsh mobile phone on the Orange network"
The first mobile phone for Welsh-speakers has been launched, with menus and predictive text in the language. The Samsung S5600, provided via the Orange network, will be available from September. The National Eisteddfod has also seen the unveiling of an iPhone application, or app, for Welsh learners. Professor Chris Price, a Welsh learner and the head of computer science at Aberystwyth University, helped design the Learn Welsh app. 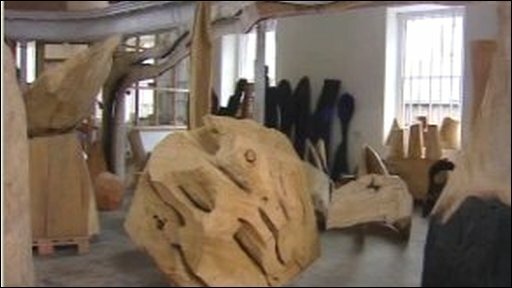 Both were unveiled at the eisteddfod in Bala, Gwynedd. Heritage Minister Alun Ffred Jones joined Orange and Samsung to unveil the Welsh phone at the eisteddfod. Sian Doyle, Orange's head of retail, said: "Orange is really proud to be the first network to introduce this truly innovative service to Welsh speakers. "This initiative is part of a broader commitment by Orange to provide Welsh speakers with more choice." More than 44,000 Welsh words will be available on the phone. Meanwhile, the Learn Welsh phrase book will available to download from Apple's iTunes. Based on Prof Price's own experience of learning Welsh, the phrase book is divided into 12 themed sections that include greetings, common phrases, food and drink, and travelling. Prof Price has also recorded each phrase, a feature he hopes will help with pronunciation. Another innovative feature is a practice mode, which offers learners the opportunity of testing themselves as they learn. "There are many apps for learning other languages available to iPhone users, amongst them 27 for French, 23 for Italian and even ones for Irish, and Tagalog, which is spoken in the Philippines," said Prof Price. "I felt it was high time that help of this kind was made available for those learning Welsh."